Following our appointment by Colchester Borough Council two years ago, we were delighted to see the goal of unifying the previously disjointed market come to fruition last Saturday at the launch of the new Charter Market in its new home in the High Street. 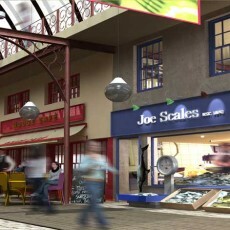 The market has returned to the High Street after many years, having previously been located at a number of disparate sites across town. 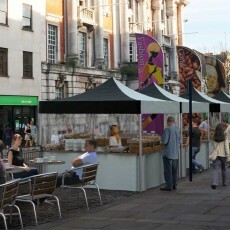 Colchester High Street offers prime footfall and early feedback from both market traders and retail shops in the High Street indicates a marked increase in turnover. 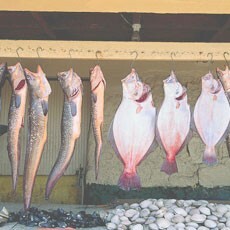 Some traders have taken the opportunity to expand their businesses, a move which seems to be paying off. 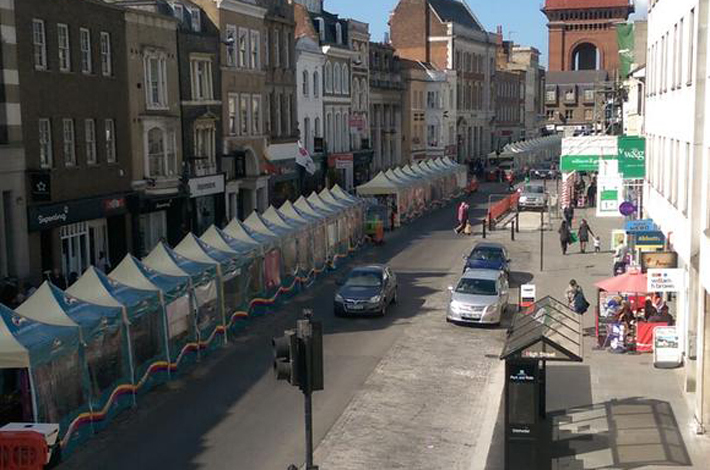 The specially designed, colourful, branded new stalls have electricity, ground anchors and side awnings and add diversity of offer and a genuine mix to Colchester’s thriving High Street on market days. 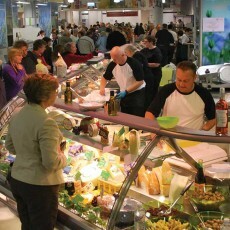 Without exception, the traders went all out to provide a stunning display of market trading at its best for launch day. Specialist meat and game, free range eggs, fruit and veg and unusual home and garden wares are on offer among ethnic foods, pet products, hardware, jewellery, baby clothes, handmade soaps, mobile phones, toys and luggage to name but a few. 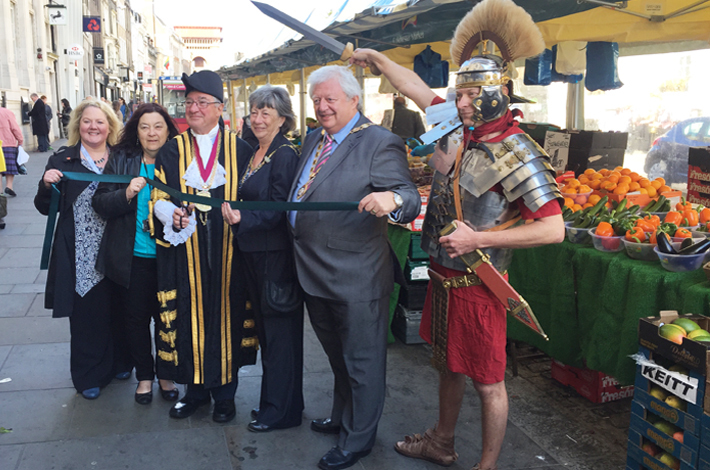 The Market was officially launched with a ribbon cutting by Colchester Mayor, John Elliott, assisted by Colchester United mascot, Eddie the Eagle, the town crier, a Roman centurion and the Blackwater Jazz Band. Representatives of the NMTF were also present for the celebrations. Convenient park and ride service now operating to encourage out of town shoppers to leave the car at home. 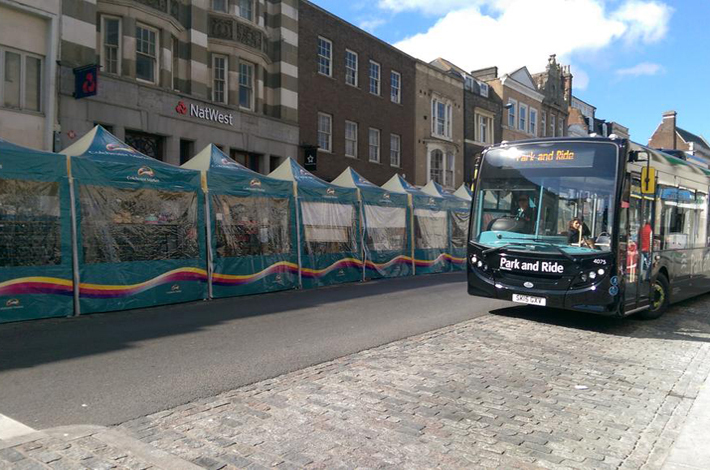 A convenient new park and ride service which drops off just by the market is now operating and should encourage shoppers from out of town to visit the town centre. Two years ago Quarterbridge was appointed by Colchester Borough Council to undertake a complete study of the town’s Charter Market, incorporating assessments of location and operational management, providing a complete overview and to make recommendations on how the Council could improve the market. Our report delivered several recommendations, key amongst them was the reunification of the currently disjointed market and relocation to the prime footfall area of Colchester High Street. Whilst we undertake this type of report several times a year, this particular project was made that bit more interesting and was particularly close to our heart as our head office is based in Colchester. Colchester Borough Council understand the importance of the market to the town and since the presentation of our report we have worked closely with the council to assist in making our joint goals of a relocated, re-energised and much improved new Charter Market, come to fruition. Through budget allocated as part of the New Homes Bonus, the relocation is now proceeding with the launch of the New Charter Market in Spring this year. 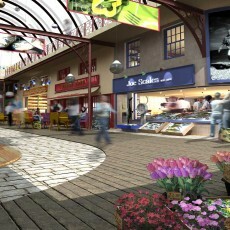 We have provided detailed on-going assistance on financial planning, the tender process for new stalls and ground anchors, trader liaison, operational documentation and guidance. 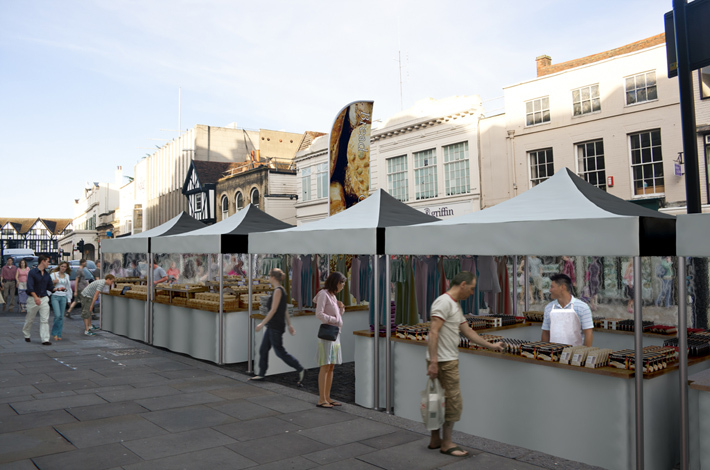 We look forward to continuing to work with the excellent team at Colchester Borough Council and enjoying the new market… right on our doorstep!